Simplifies the process of 24x7 capture of aired content and the storage of that content in proxy format. The Vela Over-the-Air DVR System is designed to capture an ATSC signal and transcode that content to a proxy format for storage. The system comes with an ATSC Tuner with 8VSB input and is designed to capture the primary and up to three sub channels from within your transmitted signal. The DVR system transcodes those channels into an MP4 file format for storage. Chief Engineers, Station Managers, and Sales Staff can search, retrieve, view, trim, and download those proxy files quickly and easily using a web based interface. Search by entering a date and time or just a program name and voila! you have your clip. Scrub through the clip, set a mark-in and mark-out, and then trim and download just the segment you want. The system comes with 1 year of storage for a single channel application (3 months for 4 channel applications). Options for more storage, more channels, and different interfaces (ASI, IP, etc.) are available. Send us your configuration details for our Over-The-Air DVR Capture System for a customized quote. Database allows for quick and easy search for content. Search based on various parameters including Channel Name, Program Name, Date and Time. Use Web UI to trim and download content anywhere. Scrub through content, set mark-in/mark-out, trim and download. It's that easy! 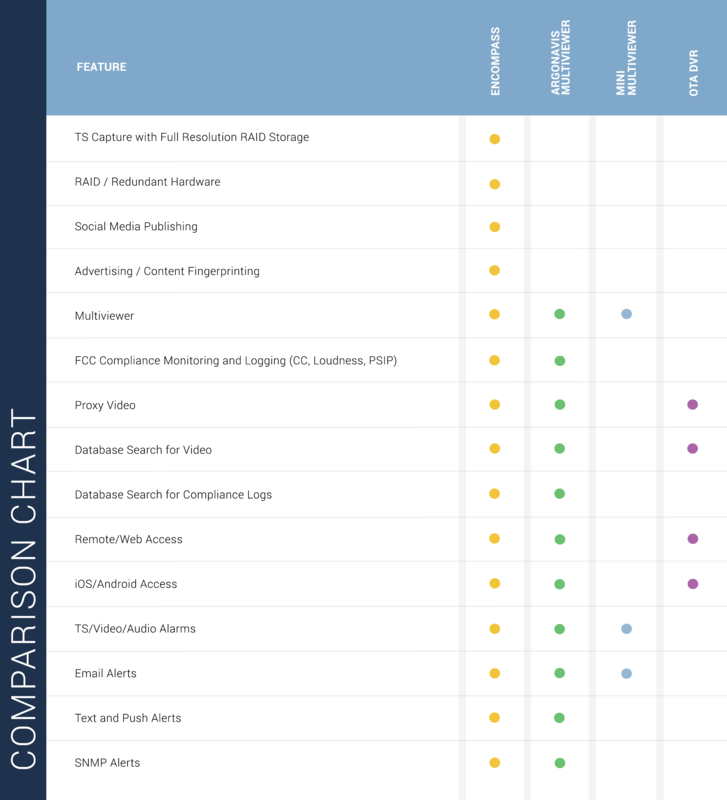 A comparison chart between our capture, compliance, and multiviewer solutions. Easily create and edit video log files for compliance and advertising verification. Easily searchable database to find clips or segments. Easily search database for content. Scrub through, set mark-in/mark-out, trim and download. Connect to and administer on a network with an easily integrated and managed Windows 7 Professional based platform. Field upgradable.